Details: Knit up fast on size 13 needles. I didn't quite get gauge, but the design is so simple, I was able to fit it easily. I made the neck wider so that the waist would fit better. Instead of a turtleneck, I bound off early. 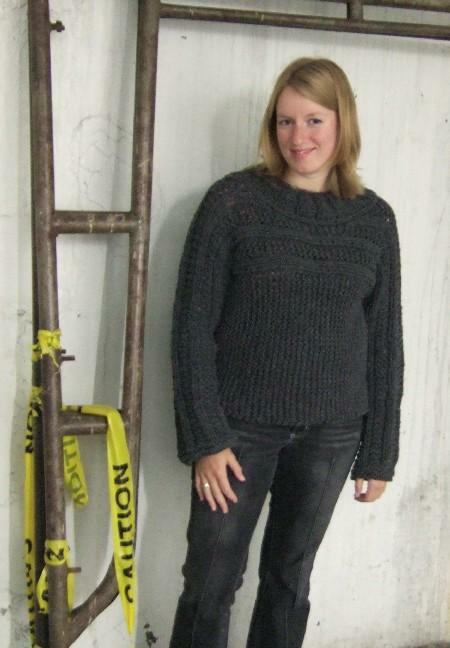 This is a pretty flattering sweater for a chunky yarn. At last! 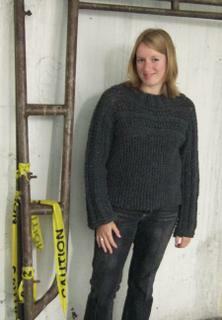 I've been looking all day for a sweater pattern to use a big stash of Lamb's Pride bulky yarn and I love this one! Is there any way you could tell me the gauge of the pattern so I can see if this yarn will work (before I work on seeing if I can track down an old issue of Rebecca)? Thanks much! The yarn suggested is GGH - SIERRA. The gauge mentioned in the pattern is in pattern, not stockinette. I looked up Sierra's suggested gauge and I think it was 3.5st/inch - which is what Lion Brand Kool Wool is.